You’ve been thinking of revamping your yard for a long time and now the decision has been made to finally go for it. Making the big leap, you’ve hired a professional to help you make sense of all your ideas, but how do you navigate the seemingly overwhelming process of getting your design started? Here are five steps that can help you answer these questions and let you know what you can expect at Blessing Landscapes to make this exciting planning phase as productive and stress-free as possible. Designing your garden begins with a client interview meeting. This important first step allows your designer to understand the vision you have for your outdoor space. Sharing your ideas through magazine photos, Pinterest or Houzz boards or sketches can often be a very useful tool to help the process along as well as providing an opportunity for the designer to consider all aspects of your lifestyle, aesthetic preferences and budget. The end goal is to have a clear idea of the design direction in order for the team to develop a preliminary concept for your space. After the initial meeting, your designer will review and analyze the site, take measurements, locate existing plants and features, note lighting conditions & microclimates, problem areas (i.e. drainage, noise, privacy issues), and take inventory of existing plants. This information will be needed to create a base map. He or she may further discuss in detail each area’s requirements such as which plants we may want to keep and which to replace, and how your home interiors relate to the exterior in terms of views and access. All these elements will be important for space-planning and the selection of appropriate plants and hardscape materials. Most designers’ creative process starts with making sketches of ideas based on the design direction established during the initial meeting. Some also might draw perspective sketches and prepare a photo mood board to show the design intent and plant selections. 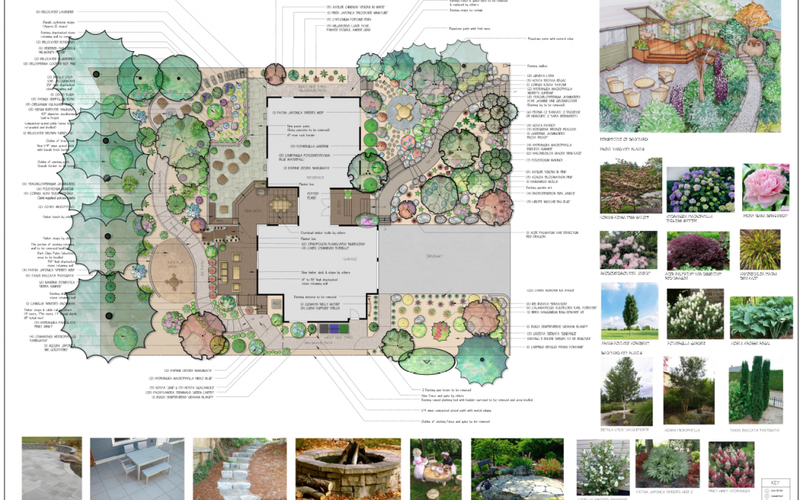 A layout plan will be prepared showing all the planting beds, hardscaped areas, plant selections, as well as structures and special features, if any, such as pergolas, outdoor kitchens, fireplaces, fire pits or water features. After a few weeks, the design will be ready for presentation. Your designer and a sales associate will present both the design and estimate for your review. The designer will explain and walk you through each area. The perspective sketches or reference photos will help you visualize your new landscape. After the design portion of the presentation, the sales associate will follow-up with guiding you through how much the project might cost if you opt to have it installed by the Blessing Landscapes team. You will be given two printed copies of your landscape plan drawn to scale, a plant list and a detailed quotation of the project cost broken down per element. This is particularly helpful for budgeting and possible phasing of the project. A link to the plant photos and hardscape reference images will also be sent to you via email. This is also the perfect time for you to provide any feedback or ask any questions, as this is still the planning stage. Your input and suggestions will help to make the final installed landscape one you will be happy with. After you’ve had time to further review the design and cost, there might be some elements you wish to change or complete at a later time. At Blessing Landscapes, we are committed to assisting you in whatever way we can. We understand that this is a highly collaborative process between the client and the design team. If needed, we will work with you to make revisions so that the final design will not only be feasible and practical but will also beautifully reflect YOUR lifestyle and vision for your outdoor space. Ready to go for it? Contact us to schedule a consultation with one of our landscape professionals.